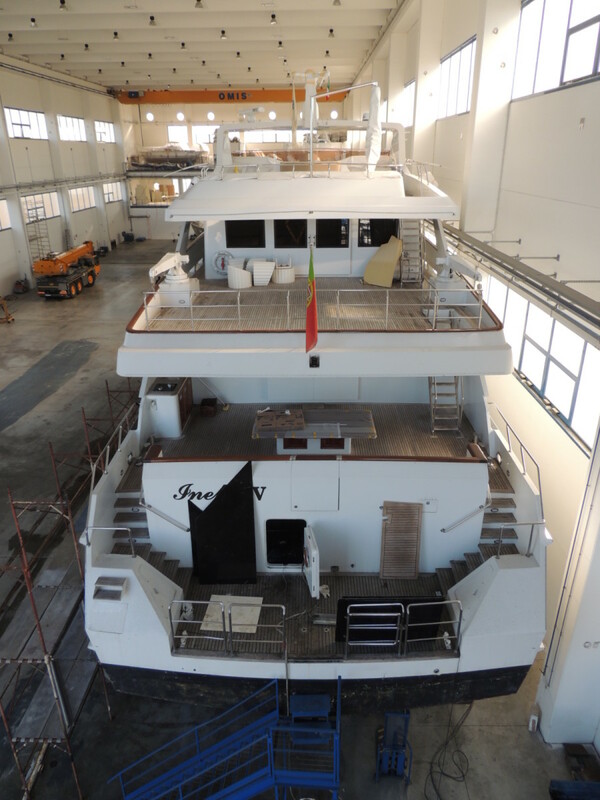 Refit is a term applied to a variety of services that shipyards offer: class surveys, paint and mechanical work, interior makeovers, hull extensions and more. 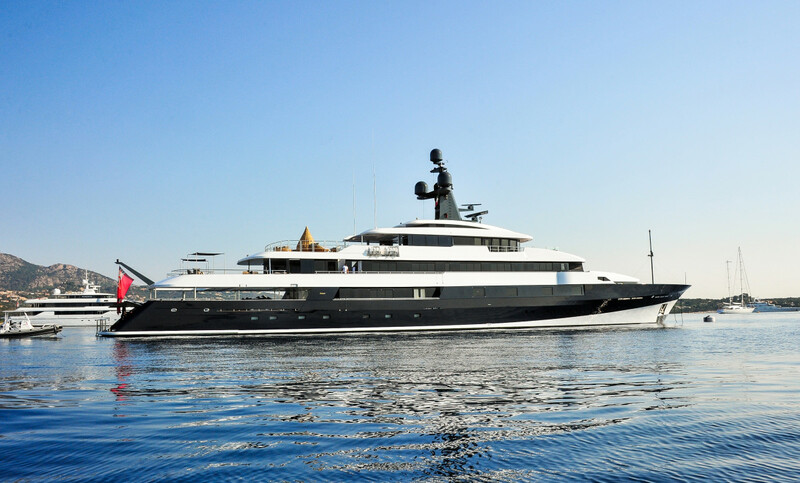 As the superyacht fleet expands, specialist refit yards around the world are flourishing. Here we focus on three transformative refits at yards in the Mediterranean. Falcon Lair undergoes (another) major makeover. 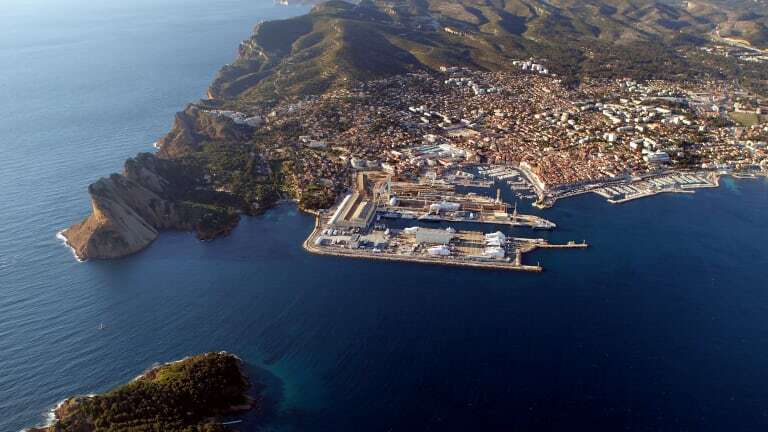 In 2015, Compositeworks in La Ciotat, France, delivered a major refit with Falcon Lair. 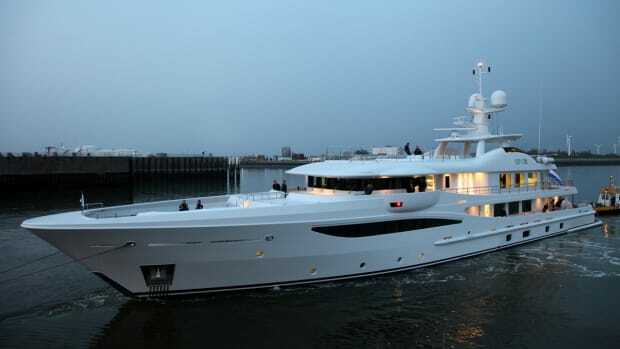 Launched by Feadship in 1983 as the 197-foot (59.9-meter) New Horizon L to designs by Jon Bannenberg and Luigi Sturchio, the now 225-foot (68.7-meter) yacht was redesigned with a transom extension by the British architects Olesinski Ltd. The work list included remodeling the superstructure fore and aft on each deck level, adding 10 feet to the transom and modifying the forward sheerline, fashion plates and other superstructure features to improve the viewing areas for guests. Dressed in classically elegant deep blue and white, with black inboard detailing, the vessel was transformed from her previous guises. RISING SUN is one of Compositeworks’ refit projects. It was not the first major refit in the yacht’s 30-year history. Following the death of her original owner, Dutchman Bram van Leeuwen (who lived on board), she was sold to the American cellphone entrepreneur Craig McCaw. 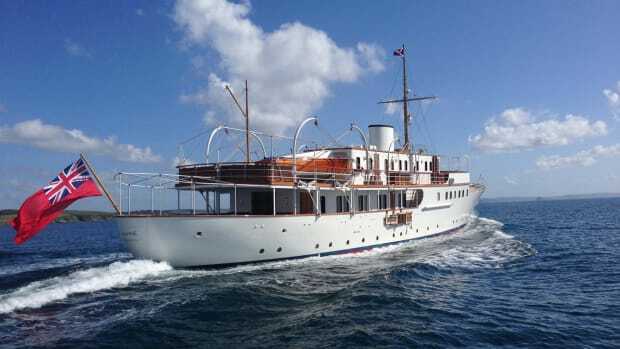 He renamed her White Cloud and carried out an extensive refit in Germany to extend the hull, modify the exterior lines and restyle the interior under the guidance of designer Terence Disdale. 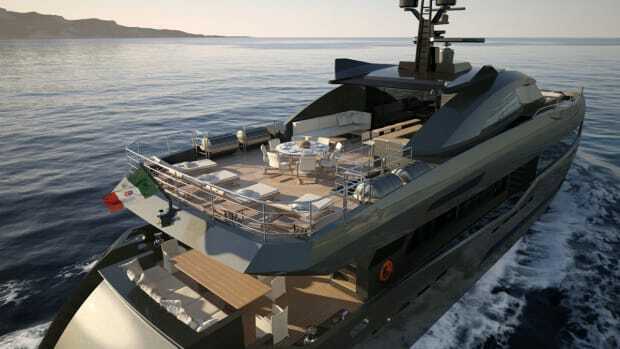 The yacht was also fitted with a jet pool on the main deck aft, a gym on the upper deck and zero-speed stabilizers. In 2015, WHITE CLOUD underwent her transformation into FALCON LAIR. 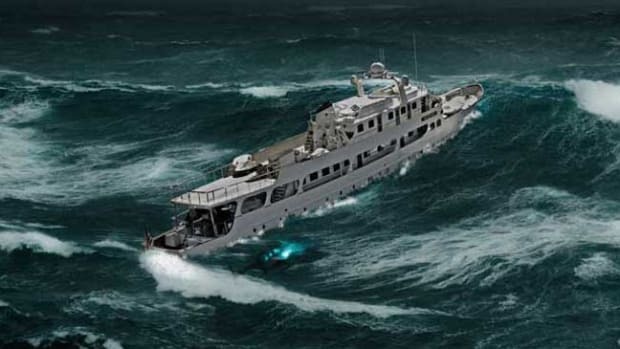 White Cloud was introduced to Compositeworks in 2006, during an emergency haul-out to replace through-hull fittings and install a new rudder system. 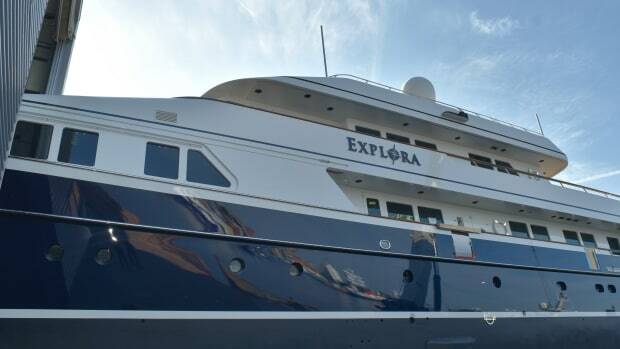 In 2010, during her 25-year Lloyd’s survey in Fort Lauderdale, her machinery and monitoring systems were upgraded and she received a glistening white paint job. White Cloud was sold to her current owner in 2014, and the yacht returned to Compositeworks to become her latest reincarnation as Falcon Lair. 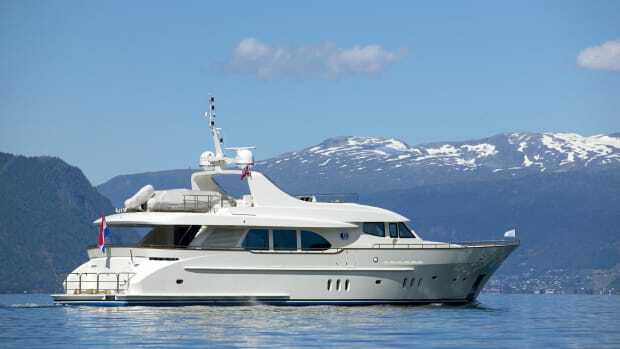 A Genoa yard gives new life to a SOLAS-certified superyacht. The transformation of 280-foot (85.3-meter) Delma into 300-foot (91.5-meter) Queen Miri by Amico & Co. in Genoa, Italy, ranks as one of the largest and most extensive refits ever undertaken. Requiring an average of 200 personnel at any time and a team of nine in-house project managers, the project was completed in 16 months and delivered to her American owner in July. 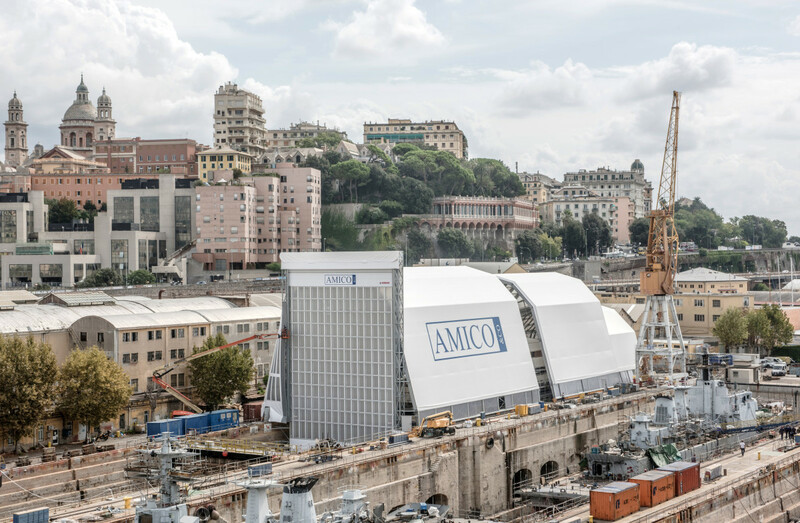 Genoa-based Amico & Co. recently launched QUEEN MIRI, one of the most complex refit projects of its kind. Delma (ex-Annaliesse) was launched in 2004 as one of two sisterships by the Neorian shipyard in Greece. One reason she was chosen for refit was that she was already SOLAS-certified to carry as many as 36 guests, and during the refit, her compliance was brought up to date. Her overall length was increased by 20 feet, but because of the hydrodynamic and shape requirements of connecting the new aft block to the existing structure, the steel hull had to be cut back by nearly 50 feet from the transom—a vast undertaking that required all of the shipyard’s technical expertise. Floating and inclination tests to verify the hydrostatic values of the extended hull were carried out in dry dock. The project also included installing new main engines, generators, exhaust systems, gearboxes, shaft lines and propellers. The power management and alarm monitoring systems were upgraded, and the rudder stocks and steering system were redesigned to match the new contractual speed. 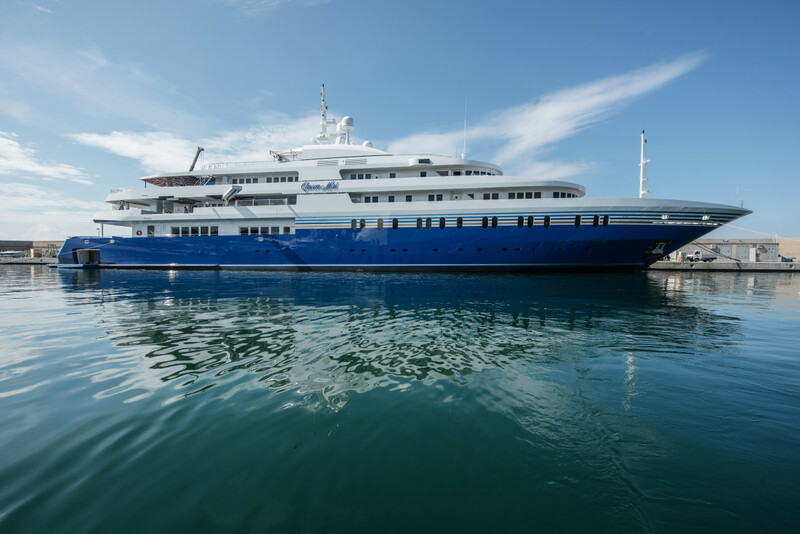 In addition to refurbishing 80 percent of the interior and installing a new entertainment system, the yard replaced much of the teak and gave the yacht a fresh, white and blue livery. New exterior features include a 10-person hot tub on the sundeck, a spa and relaxation zones, and a drive-in tender garage that doubles as a heated seawater pool. Late additions to the wish list were two fold-down platforms on either side of the transom, to extend the beach club. Cloud Atlas grows longer and better with age. 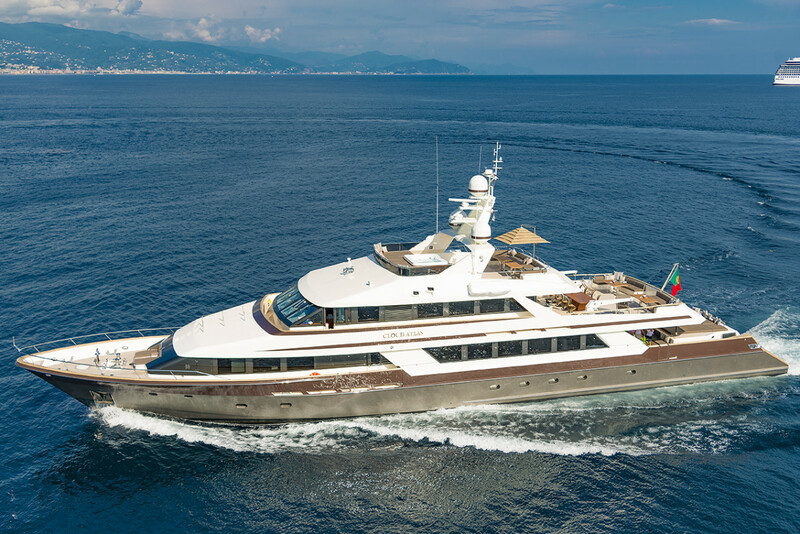 Cloud Atlas was reborn following her refit at Italy’s Seven Stars Marina & Shipyard, which is located on the channel that connects the entrance of Livorno Harbor with Pisa. 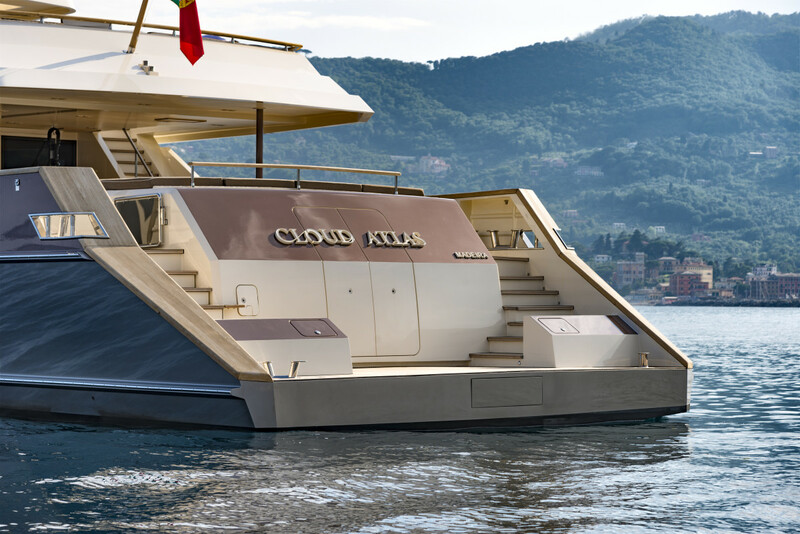 Originally called Ineke IV, Cloud Atlas began life in 1990 as a 130-footer (40-meter) built at Lloyd Ships Holdings in Australia. Sold to a new owner in 2015, she now bears little resemblance to her former self. The owner realized that the VIP stateroom, situated aft, was noisy underway, and that the noise and vibration problems did not stop there. He also felt there was too much “sloshing” noise from the aft platform and too little stability while cruising or at anchor. By lengthening the yacht to 151 feet (46 meters), Nauta Design in Milan not only helped enhance stability and performance, but also increased the garage space. “We created a side-opening garage to accommodate a large tender and Jet Skis, and we also found space in the transom to host the owner’s beloved motorcycle,” says Nauta principal Mario Pedol. Lengthening the yacht’s stern and upper deck created a more pleasing aesthetic overall. INEKE IV suffered from noise and vibration issues. Increasing the length of Cloud Atlas meant adjusting the bow trim. 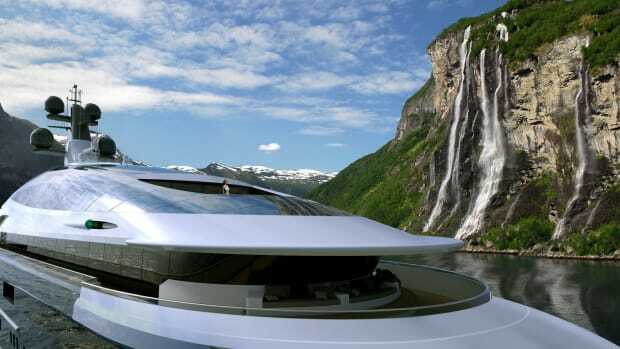 Studio Francesco Rogantin Naval Architects and Marine Engineers studied the hull with computational fluid dynamics analysis. “We had to work on the whole propulsion and steering system,” Rogantin says. “The shaft lines were lengthened about 3.7 meters [12 feet 2 inches] with new intermediate shafts and new V-brackets. Also, larger rudders were placed in a new optimal position to improve maneuverability. We worked on the skeg in order to protect the propellers and to lend directional stability.” To cap it off, they added zero-speed stabilizer fins. 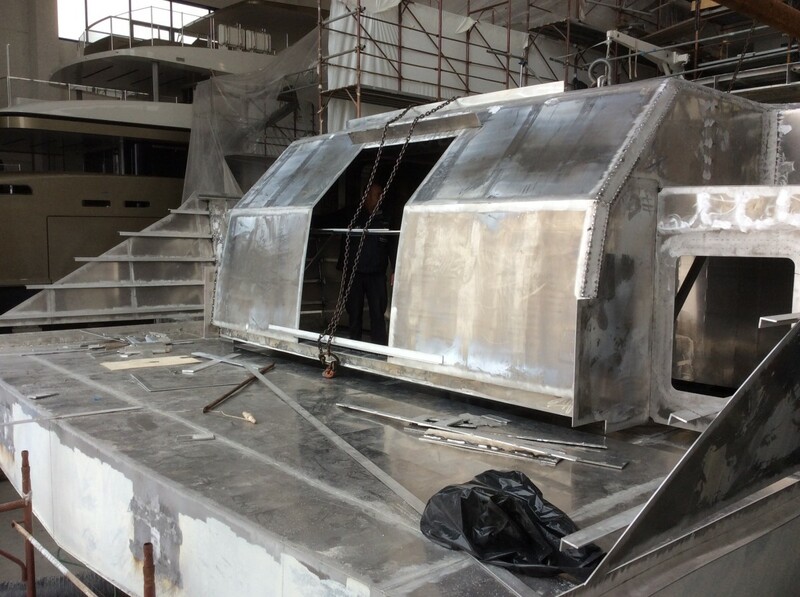 Extending the yacht by nearly 20 feet not only allowed for a more spacious garage area and larger swim platform, but also enhanced overall stability and reduced the sloshing noise from the stern. The previous bow thruster had a single propeller. The new system has dual contra-rotating propellers. 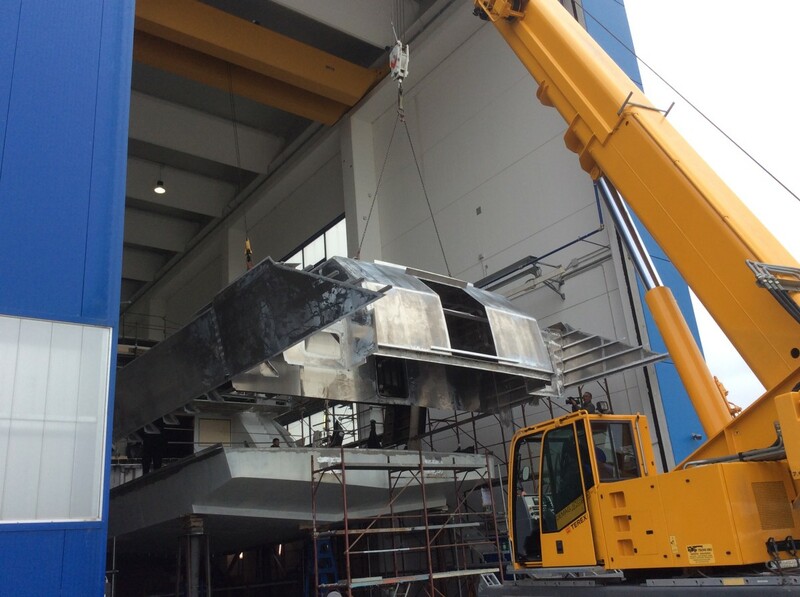 A lot of attention was given to the fairing of the new bow thruster tunnel, to maintain the tunnel shape. Seven Stars also rebuilt the main-engine exhaust fairings with a more efficient shape. The completed aft extension of CLOUD ATLAS. Seven Stars finished the refit in approximately six months. 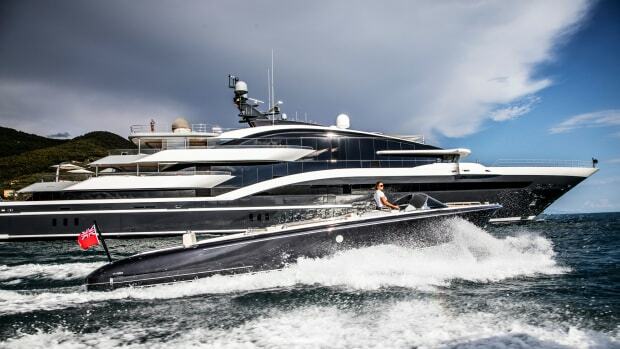 “The yacht gained 2 knots of speed with a significant reduction in fuel consumption thanks to the reshaping of the propeller tunnel in the stern area and the shifting aft of the 10-foot propeller,” says Davide Mugnaini, managing director of Seven Stars.